Warning: If the following illusion makes you nauseous or dizzy, please scroll down to the next post. 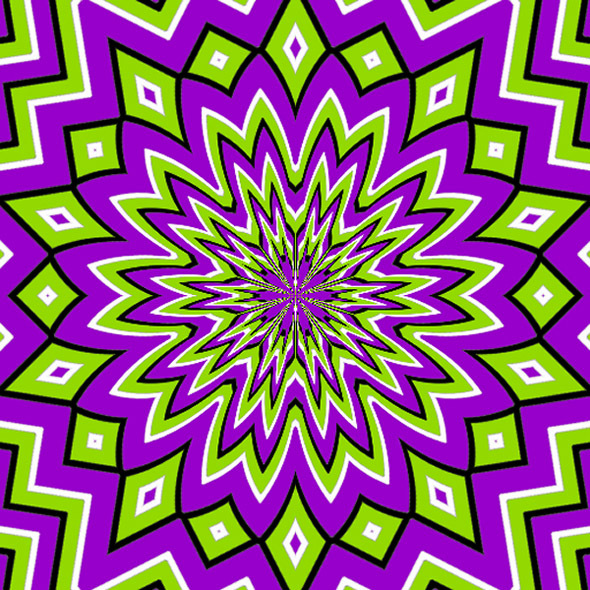 The Purple Nurple, as this illusion is called, is what’s known as an anomalous motion illusion (sometimes grouped in with animation optical illusions), whereby a series of shapes and colors creates the appearance of movement while staying completely still. The illusion style was first created, studied and perfected by Professor Akiyoshi Kitaoka, who noticed that certain images appear to move when viewed with your peripheral vision. The effect is utterly surreal, making the viewer feel as though he or she is on some type of psychedelic drug, even if he or she has never messed with the stuff before. This particular image was created by Walter Anthony. Prev Coffee..The Whole World Enjoys It! The movement in the illusion depends on my eyes moving (saccades). If I hold my eyes still, I can see the picture “as it is”. Oh, wow. I feel like you have totally commandeered my sense of sight. Well done! P.S. Are shirts available? Wicked illusion. Reminds me of the 60’s and 70’s acid head posters. LOL, w/OUT the acid !! Seriously though, nice effects. nauseous is not the way something makes you feel it is an adjective. When somthing makes you sick to your stomach you are nauseated. If you are nauseaous you make others sick to their stomach or nauseated. A common error but I thought you may want to know. how can i submit a illusion? 1. Wasn’t this here before? If it was, Jill, please don’t repost them. 3. Most of us know it. And to Aaron, ZL and Jill…..who cares if it’s nauseous or nauseated, we get the point. And if it’s been posted before, just move on and wait for the next one. SOME OF US ARE NEW HERE AND HAVEN’T SEEN THEM ALL. Anything that distracts me from work is okay with me. Constant movement, love it. Good job Jill. where’s this next post to scroll down too? if u put ur hands over the pic , u can tell it isnt moving. I am going to try and explian this illusion. I say “try” because I might be totally wrong. chemical reaction occurs, sending an electrical signal to the brain where we process and percieve the image. white is all colors and black is the absence of color. Great stuff. Reminds me of what some of us wore in the ’70s. Keep your eyes on the + and the celebrities will look weirdly distorted. mum does not get it home stay sis does not get it but i do!